Public-private partnerships involving wastewater are part of an innovative approach to sustainability that delivers results. Wastewater is an overlooked and underutilized resource that delivers results. Businesses, communities, residents, and the environment all stand to benefit from wastewater initiatives. This reduces demand for clean water which is particularly important in areas subject to drought. Corporations are coming to terms with issues related to resource scarcity and increasingly showing leadership in water management. The three year long drought and resultant water crisis in Cape Town is a clarion call. On May 4th the four-million residents of South Africa's second-largest city will run out of water in what is being called "Day Zero" The availability of water is or will be a major concern for many cities and towns around the world. Some of the big cities that are currently concerned about water shortages include São Paulo, Bangalore, Beijing, Cairo, Jakarta, Moscow, Istanbul, Mexico City, London, Tokyo and Miami. Corporate America is getting ever more serious about sustainability and water is a major focus of their efforts. The water demands of most businesses make such considersations an indispensable part of sustainability initiatives. This implies that they work alongside the communities in which they are located to collaboratively plan strategies to manage water scarcity. Businesses are cooperating with governments and local resident to develop strategies that mitigate risk. In some cases the private sector may require government incentives to recycle, store and capture water. 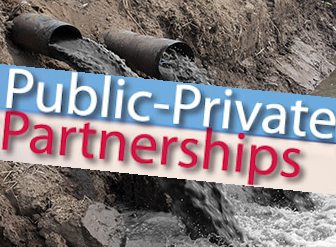 Public-private partnerships are one of the most effective ways of addressing water scarcity. Sustainable water management partnerships offer win-win scenarios for both businesses and communities. This benefits the economy, the environment and local residents. One such partnership can be found in drought-prone North Central Texas. To address the problem of water scarcity businesses are cooperating with local towns to come up with some creative solutions. As reported by Triple Pundit, two cities in Texas are collaborating with a hygiene solutions company to manage their water resources. A Sealed Air plant in Iowa Park is now using recycled effluent water from the town's wastewater treatment plant. By using abundant wastewater they have reduces their demand for potable water by 40 percent. The water reuse partnership between a Sealed Air plant and the towns of Iowa Park and Wichita Falls will conserve 19 million gallons of drinking water each year. The idea for this innovative $1.5 million project arose as a consequence of sustained periods of drought in Texas. Effluent water is an ideal solution because it is drought proof and has environmental co-benefits like reducing demand on clean water. Businesses across the country can benefit from collaborative wastewater projects like the one in Texas. Another form of wastewater, referred to as greywater, is already being used extensively in the beer industry. The demand for wastewater solutions will continue to grow as water resources become ever more scarce.